As a career-long construction supervisor, Joe Streett knows what to expect when managing a lengthy project that extends to over a year—like the expansion of State College Alliance Church in State College, PA. Research, Relationship Building, and Patience are the three virtues he espouses as his keys to success. “Good relationships are earned…and that starts with a lot of research. I’m very fluent with blueprints, so I had no problem understanding the intent of the project, as well as where more clarification was needed.” The intensive research and delving into the project’s intricacies provided a solid foundation for Joe to build upon. 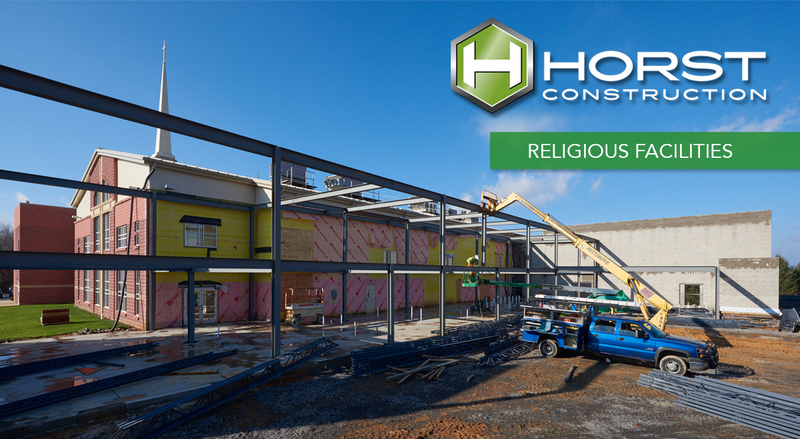 “I wanted to build trust with the Horst team, my subcontractors, and of course, the client, pastor and building committee.” That team-oriented approach is one of the marks of a Horst project. At the end of the day, the purpose is clear—to create an exceptional environment and a happy client. On a personal note, Joe partially relocated for this project. He traveled from his home in York and stayed near the project site in two-week intervals. His wife joined him when her schedule allowed, and they went home every other weekend throughout the project to spend time with family. This dedication to the project and time spent away from home led to Joe and his wife attending State College Alliance Church on the Sundays they were in the area. The immersion provided an additional perspective for Joe; “It is usually crowded at State College Alliance Church services. They are growing and clearly need more room.” Seeing this need first-hand further fueled Joe’s understanding of the project. State College Alliance Church is just about complete. The lobby floor is being finished over the next few weeks, and children are already using the classrooms and gymnasium. For more information regarding this project, click here.